Rise & Shine Festival is celebrating their 5th birthday this year in August and they strive to continue their mission of helping parents build champions of tomorrow and raising happier, healthier, brighter children! 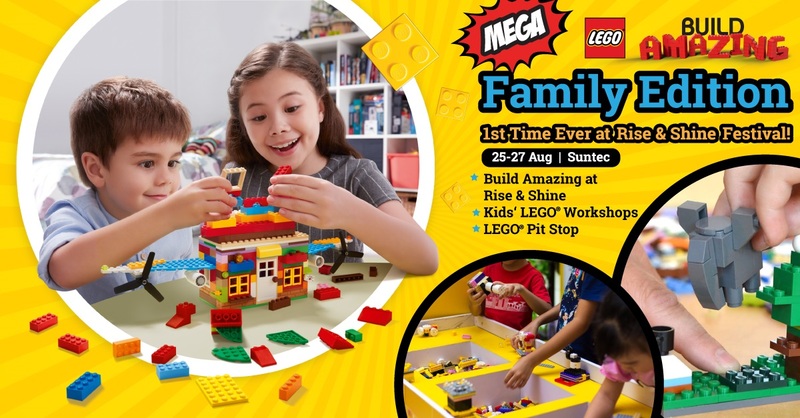 For this special installment, they are collaborating with LEGO to bring together the LARGEST Learn Through Play Festival! Here are some of the events you can expect to see during the event. Take part in Singapore's Largest LEGO® building competition for families and win up to $400 worth AMAZING LEGO® prizes and more! There are limited space available at the competition pit so pre-registration is required. Kids get to build their own LEGO® Race cars and put it to a speed test on the racing ramp. The Mission Pass offers kids access to a full day of fun games & exciting activities where they can learn and play at the same time. Kids who completed the pass can redeem a goodie bag worth $50- only valid for the 1st 3000 successful completion. Experience go-karting like no other! Let junior experience the thrill of car racing in a controlled and safe environment at our super awesome mini circuit! Come as an individual or with parents! Get dressed up in your favourite gear, and strut down the runway! Win up to $300 worth of prizes! Bring along the confirmation email for entry. Each participant receive goodie bag worth $20. Parents can enrol their kids in a short interactive workshop in Yoga, Dance, Speech, Music, Memory techniques. Rise & Shine Festival- Asia’s Largest Edu-Fun Fest!